What is a Corrosive Substance? Corrosives are classified as either caustic or acidic materials that can burn or destroy human tissue and metal structures. The two most popular acidic corrosives include hydrochloric acid and sulfuric acid and two of the more popular examples of caustic corrosives are sodium hydroxide and ammonium hydroxide. Human exposure to corrosives can cause permanent scarring, blindness, lung injury and even death if extreme exposure occurs. Corrosive storage solutions by US Chemical Storage offer temperature controls, fire suppression and other safety accessories for full compliance. Store corrosive materials away from incompatible materials, and incompatible corrosives. Corrosives can sometimes be incompatible with each other depending on chemical properties. It is necessary to fully understand Material Safety Data Sheets of each corrosive chemical, before storing, to prevent a hazardous situation. Store corrosives in a dry, well-ventilated corrosive storage building, implemented with a fire suppression system and labeled with proper warning signs. Utilize mechanical ventilation, cooling systems to keep corrosives at a stable climate. Corrosive storage should not be stored near ignition sources including heat or direct sunlight. Corrosive chemicals must be stored in a climate controlled environment to avoid rapid temperature changes. If sealed containers containing corrosives are stored in a heated environment, vapor levels can build up, causing increased pressure inside containers. In extreme cases, corrosive containers can explode. Dispense corrosives from one container at a time. Ensure each container is closed after dispensing. When transferring corrosives from drums, use a corrosion-resistant drum pump for transferring liquids into separate containers. Do not overfill containers with corrosive materials. If overfilled, pressure can build up causing the container to explode. Do not use old drums for refilling. Previously used drums may contain residue from incompatible materials. Wear protective equipment when handling or storing corrosives; including eye equipment and a face shield. Do not stockpile corrosive inventory. 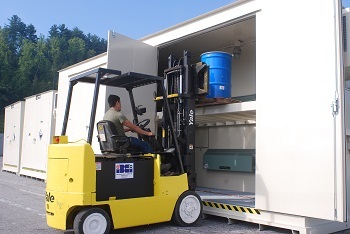 Treat drums and other containers that were previously used for corrosive storage as corrosive waste. Do not dispose of corrosives or other hazmat chemicals down sinks or drains. Remove empty containers from working and manufacturing areas. Have Material Safety Data Sheets on-hand or nearby. Locate nearby eyewash stations or safety showers before handling corrosives.